…especially if it’s a 2-seater! 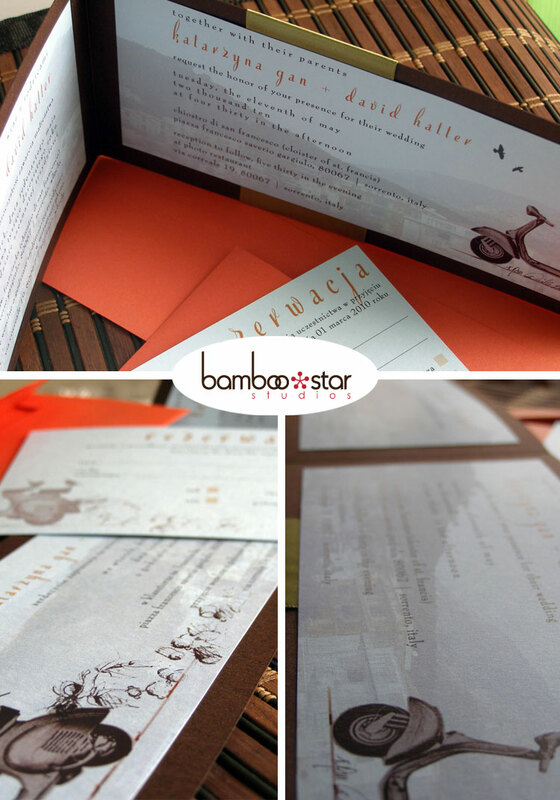 these invitations were inspired by a fun, multinational, world-traveling, moto-loving, bride and groom from alameda, ca (by way of poland, in kasia’s case! ), for their intimate wedding in the quaint coastal italian city of sorrento. 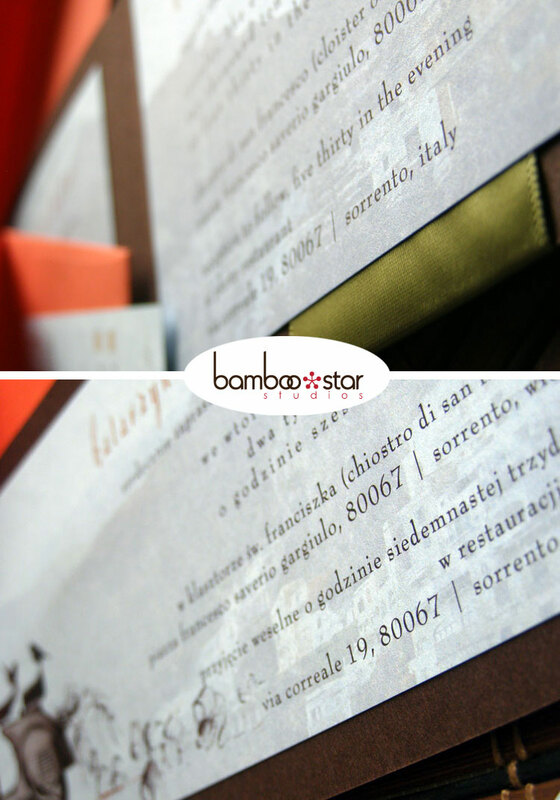 working closely with dave and kasia, we created this elegant design, with subtle, yet truly remarkable finishing touches throughout… starting with the blind embossed vespa and initials on the invitation cover, to the green satin ribbon accent, the muted photo of the sorrento coastline, english/polish translations, all the way through to the hand drawn sketches of lemons tied to the vespa’s bumper. each and every one, a personal touch, to capture the true feel of kasia and dave’s incredible wedding day to come. 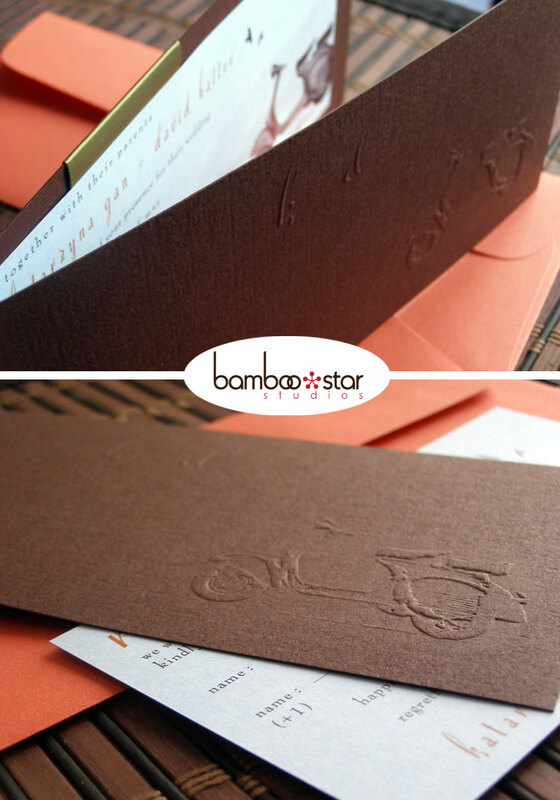 Beautiful invitations. How did you come up with the embossing idea? My word that lil’ vespa is darling! inspiration courtesy of kasia & dave! they wanted something elegant, without adding too much weight or bulk to the invitation set as a whole (since a lot of them would be sent out internationally). so after we helped develop the vespa idea, blind embossing was a natural choice for the subtle, yet perfectly stunning touch on the outside cover. Great piece, can’t wait for more.